I've been feeling a bit blah with outfits lately, especially at work, so I decided to take to Pinterest and get some inspiration. None of them are particularly mind blowing or original, but sometimes you need a little help. I just wanted to try and utilise some more of the things in my closet, without buying more. This post contains affiliate links, meaning if you click, I make like 2 cents. Thanks! My outfit: Target striped top (similar), midi skirt (similar), Target wedges. My outfit: J Crew blouse (similar), Target pants, Cynthia Rowley (from TJ Maxx) cardigan (similar), Target flats. My outfit: Target striped top (similar), grey pants (similar), Target cardigan, Target flats. these pants were in the goodwill pile, and now I remember why. I'm not a fan of this outfit, but I thought I'd share it anyway. My Outfit: Loft blouse (similar), Target pants, leopard flats (last I checked, they were on sale for like $12, insane! I paid $25 I think, they take some breaking in but I love them). Fran is standing in snow, and I'm the one with tights on underneath my pants. Oops. I probably should have tied my little bow, my bad. 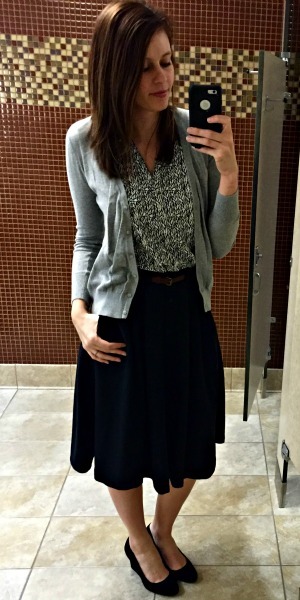 My outfit: Sleeveless blouse (similar), midi skirt (similar), H&M cardigan, Target wedges. My outfit: Express one eleven tee, Nobody jeans, Gap knit moto jacket (very similar), leopard flats. My outfit: Express one eleven tee, Nobody jeans, Aldo booties (similar). This might seem like a silly outfit to copy or post about because it's so simple (I rarely wear scarves to work, so I skipped that) but (and this might sound ridiculous) I would never have thought to pair blue jeans with this colour top and then tan booties. So thanks, pinterest. My outfit: Express one eleven tee, old navy rockstar distressed jeans (old, similar), striped flats. I felt like swapping for navy, but hey. It works. Before I did this little experiment, I would grab some pants, a shirt and some shoes, voila outfit. It worked, but it wasn't cute or exciting so I'm glad I branched out a bit. It was fun deciding what to wear and which outfit to copy (or get inspiration from). It helped me shop my closet, and it also helped me actually do my hair and makeup if I knew I was going to take a photo. I didn't do this every day of course, but it was fun every couple of days. I'll definitely be doing it again. I always do this with pinterest to "up-grade" my existing outfits too! You are looking so fit too btw! Girl I am LOVING these! You must have a mega wardrobe to be able to recreate so many of these so well haha (and that, I'm envious of!!) That Gap moto jacket is everything--love it! I'm way impressed with how similar these look- and your hair is on point! This is such a good post idea! Your outfits are so cute...I especially love the first one!! I love looking at Pinterest/fashion blogs at outfits but I forget to actually think about them while I am getting dressed. You have totally inspired me to though! Hope you have a great weekend! Love the outfits, that stripped tee and skirt combo is so cute. I often use Pinterest to try and recreate outfits as well. Especially since I don't go shopping often with the crazy high prices in Iceland it is nice to feel like I am mixing up the wardrobe at least a little bit. 1. You picked out some awesome outfits & 2. You did an even better job recreating them! You're looking stylish my friend! Love your outfits. I admire your commitment to looking fresh. I get in a rut a lot unless I lay my clothes out, which I haven't done since November. You nailed them all!!! Such a fun idea to use things you already own to create new looks. Your hair looks fabulous! I think the first look is my favorite, because its not something I would have ever thought to do. I love that skirt you're wearing in the top pic, and have had it on my list to pick up a midi skirt for the spring. Really cute! I also super adore that polka dotted blouse an it's perfect with the colorful cardigan! But the dress + cardi + boots, hello gorgeous! Such a fun and very pinteresty outfit :) LOVE that Gap jacket/blazer too... might have to give myself permission to hunt that down right now. Love this! You really nailed the looks. I'm also terrible about just grabbing a top and bottom without really pulling the outfit together. Pinterest is so great for getting new ideas. I'm having a hard time picking which look is my favorite. Which I know you care about so much, ha! But they are all so cute! Especially the dress with the mustard cardigan look. And the moto jacket. And all of them. I know this is a post about clothes, buuuuut seriously, how do you get your hair so voluminous? Jealous. Cute! You nailed all of them! 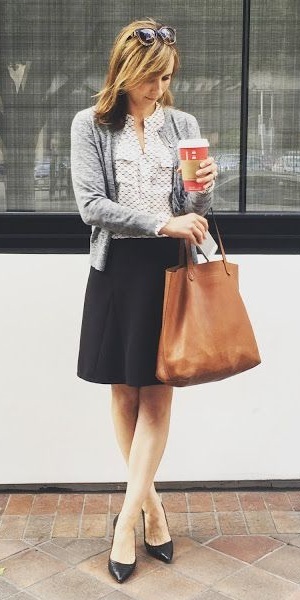 I really don't use Pinterest that much, but it is a great resource for outfit inspiration. I'm like you, sometimes I don't even think to put the simplest/most obvious things together! And now I wish I hadn't gotten rid of that polka dot blouse :/ It was always kind of boxy and fit weird but it looks great on you! My bad...wrong account (cleaning up emails)! So so cute!! I love every one of these outfits! I know what you mean about just throwing on clothes without putting a lot of effort into it. I can be bad about that. But I love when I take time to plan an outfit because I look better and feel better about how I look! Also I'm with Emily, how do you get so much volume in your hair? Don't I remember you saying at one point that you have thin hair? Wasn't that you? Or maybe I'm mixing you up with someone else. Either way, I want to know your secrets! that pink blouse is gorgeous!! I love all of these outfits though and you totally rocked them!! I love all of your outfits!!!! If I had to pick a favorite, I would say the one with the jacket. And that jacket seems to be on such a great deal with the link you shared. And those leopard flats are less than $20?!?! I am so freaking tempted to scoop those up to. Are those the exact ones that you have from AE? Are they comfy? Flats are so hard for me. You are one stylish chicka in all these cute outfits!!! You need to teach me how to do hair, because yours looks SO good in these pictures! ahh so jealous. I love all of these outfits, especially the first one. How you managed to make horizontal stripes and a full skirt look that flattering...just doesn't make sense! Amazing! These outfits are so cute! Looking at Pinterest is such a good idea for outfit inspirations.. lately I've just been using it for recipes. Have a good weekend! Look at you - you nailed all the looks. I'm impressed. Love all the outfits but the two with the midi skirts are my favorite! Shooot, you are your own Pinterest inspiration. Such great recreations, lady! Love the polka dot top. every single link has been clicked ;) This is such a great pinspired wardrobe example and think you pulled off every look flawlessly. In fact it would be delightful to try to copy your looks and link 100% back to your page, Kristen-spired. You did a great job with the inspos!!! Love that mustard cardigan and lightweight polka dot blouse. Great job shopping your closet! You're outfits are just so dang cute! Love them. I am bad about wearing the same outfit combos on repeat and it's nice to get some different ideas from Pinterest! Love this post. :) Happy weekend lady! So many amazing outfits! Love the first and second ones. You could totally be a fashion blogger btw! You are so great at this. I always try to recreate outfits and I usually fail. You're so cute. What the what??? You nailed like every single one!! You look great as always! I am inspired to maybe give this a try! Have a great weekend! You did a really good job! I really need to spend some time looking for work outfits on pinterest that would work for me and then go buy the stuff and make them happen <<< but that last part is the hardest! And the award for best fashion mimicking goes to... YOU. My gosh, you look amazing on your own but seeing how well you copied a look made this even better. I LOVE that navy Loft blouse look you have. You seriously look so cute and that's the best work outfit. Love!!! That's such a fun idea to help style things out your closet that you normally wouldn't put together! Those booties look so cute with those jeans, and I really love all of your fun flats! I need more fun flats in my life! You nailed those outfits! I need to actually try this. I just grab clothes out of my closet & while I don't look like completely crap I could look better for sure! I need a shopping day!!! Like I seriously want to go through my closet and start over Ha! That skirt is adorable. I could definitely use one in my life. These are all wonderful, and the first one especially rocks! These are all so cute! I especially like the very first one and the one with the yellow sweater. You rocked it! You did an awesome job, you look great!! Those outfits are all so cute! wow you are KILLING IT. these are spot on. i love when pinterest comes through and makes you realize you can pair odd colors or textures and looks great. All great looks but really loving the teal and polka dot! I've been in kind of a fashion "slump" and struggling with how to mix up my wardrobe. That's a wonderful idea from Pinterest/other bloggers and doing it with your own stuff. Going through all the different looks you assembled definitely makes it seem like a very do-able idea for more outfit inspiration. Love all of these! I wish I could pull off the fuller midi style skirts but I end up looking like a cupcake-- I'm just too short and round, lol. But you've inspired me to look at Pinterest for outfit ideas because I wear the same things, together with the same things pretty much all the time. And now I really want a few of those Express tops- they really do look good with everything. You think your outfits are blah?! You should see my outfits on the daily basis... which sweatpants to wear?! Oh, the struggle! ;) I love all of these outfits! They look great! I never think to look at my pinterst boards for inspiration but your right, when you make a point to do it, it makes getting dressed seem like your closet is that much better! awesome post! great ideas for me to try, too! and you had me at stripes. always!!! This is such a fab idea and I think you pretty much nailed every outfit to perfection! you look great.. what a great idea.. in fact some you did better.. especially the yellow and gray outfit.. totally better! Ahhhh!! Such a good idea! You look amazing lady, and such a good way to get some inspiration! Um, you are killing it in the fashion department! Fashion blogger here you come! You're lying to us all about your job and you're really a model right??? I totally pinned one of your outfits for outfit inspiration myself! Thank you so much for this post, I have been hating everything in my closet of late. This is so inspiring!! Thank you!! I love all of these! I used to be really good at planning out my outfits from Pinterest and then I stopped. I need to get back on that...by the way I definitely have those Target flats! 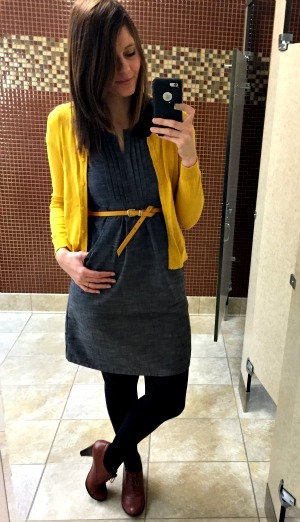 The first outfit and the grey dress with the yellow cardi are my faves, but they're all cute! I haven't been on Pinterest much lately (and I NEVER seem to remember to use my blog Pinterest account! ), but when I do get on my personal account it's either to look up recipe ideas or style ideas. I used to think I was a decently stylish person, but now I feel like I need someone to actually show/tell me what to wear and how to wear it because I just have no idea how to style certain clothing items and accessories. I'm lucky in some ways that I don't have to dress up for work, but unfortunately this makes me feel very "blah" most days. Once in a while I switch things up and wear something a little cuter (today I wore skinny jeans, black boots, and a cute and comfy Lou & Grey top from Loft), but usually I'm in a t-shirt and/or hoodie (depending on how cold it is), jeans, and comfy shoes. Definitely NOT very put together! Haha. The first outfit pic is my favorite. I never thought about using Pinterest for fashion inspiration but might check it out now. May give me new ideas. You pretty much killed it with the outfit replication! I always see things I like and then wayyyyyyyyyyyy miss the mark trying to do it myself. Oops. Oh well. Love that blue skirt on you! Not everyone can pull of a midi skirt, looks great on you! So so cute!!! You killed it with the recreations! The first one is so cute! Love that skirt! You little cutie patootie! That first outfit and the one with the mustard cardigan, you look soooooooooooo adorbs! These outfits are so cool and classy. I am going to buy one of these for sure. I have saved all these pictures. Thanks for sharing. I love looking to Pinterest for outfit inspiration... otherwise, I'm the same way. T-shirt? Jeans? Flat? Okay, I'm good to go! I like your interpretations even more than the Pinterest versions! Wow, these are some pretty spot-on recreations! I mainly use Pinterest for recipe inspiration but maybe I need to start picking up some fashion tips, I'm feeling pretty uninspired by my wardrobe lately! You nailed it with these! I need to do this with my clothes! Love the looks. The gray dress and yellow cardi is my favorite one on you. I LOVE this idea. I am the same way - I wear everything the same way every time. I might have to try this :) I love the yellow cardigan with the dress.